I’m off for President’s Day, so I’m planning a departure from our usual Breakfast for Dinner Monday. I usually make Chicken Parmigiana (courtesy Once a Month Mom) on Sundays since it takes a lot of time to flatten the chicken. The rest of the recipe is super simple. I haven’t frozen this recipe yet for future meals, (I don’t know why, we love this!) but I should. 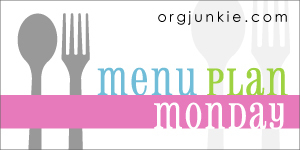 This week’s meals are based on getting Johnsonville sausage on sale (with a coupon!) for 1.89/pack and the old standby boneless skinless chicken breasts for $1.99/lb. I referred to the 1 bag 5 dinners chicken and pork for ideas (and an already pre-made shopping list!) but using the chicken sausage that was on sale. So this is how it’s shaking out for the week ahead. Sunday: Play by ear, maybe dinner out (hmm, Out of Time Dad?) or a new recipe I’ll discover this week. That’s what we’ve got going on this week. Thank you to Organizing Junkie for the link up this week here. I love seeing what everyone else has planned! Thank you! I’m kind of hoping they leftovers are gone by Thursday so I can have the sausage rotini! It looks so good!